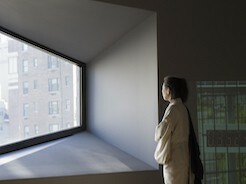 Eiko will be the guest speaker at Donald Keene Center of Japanese Culture at Columbia University's annual Soshitsu Sen XV Distinguished Lecture on Japanese Culture on May 10, 2019 at 6pm. 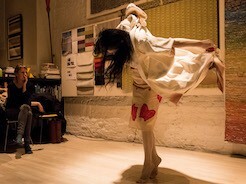 For this occasion, Eiko will share her specific notions of body, choreography, performance, practice, politics, time, history, place, and teaching. She will reveal how the multiple distances that make up her life and career have been malleable and at times even collapsible, both intentionally and otherwise: distances from the Japan where she grew up; from New York City and the U.S where she has lived since 1976; from the modes of American modern dance, her teachers, and collaborators; and from her long-time concerns with language and the issue of the nuclear. This malleability of distance examined by her self-curated immigrant body, that of a stranger in different places, is the core of her work. The event will begin with Eiko's solo performance and will continue as a hybrid talk and videos edited specially for this occasion.